This Android malware acts as an SMS relay. It uses the infected device as proxy for sending and receiving SMS messages. As a result, affected users may be charged for sending SMS without their knowledge. To get a one-glance comprehensive view of the behavior of this Trojan, refer to the Threat Diagram shown below. This malware has certain capabilities such as sending and receiving SMS, deleting SMS, getting installed applications, deleting and updating itself. This Trojan may be unknowingly downloaded by a user while visiting malicious websites. The configuration file contains the message body of the SMS and the number it sends to. It also contains where the malware forwards SMS messages, posts installed applications, updates itself, and where to notify the remote user for its status. Once the message is posted, the malware deletes the SMS from the affected phone to hide itself from the user. Please note that the analysis above is based from the XML configuration downloaded by the malware at the time of this writing and may change anytime. Trend Micro Mobile Security Personal Edition protects Android smartphones and tablets from malicious and Trojanized applications. The App Scanner is free and detects malicious and Trojanized apps as they are downloaded, while SmartSurfing blocks malicious websites using your device's Android browser. 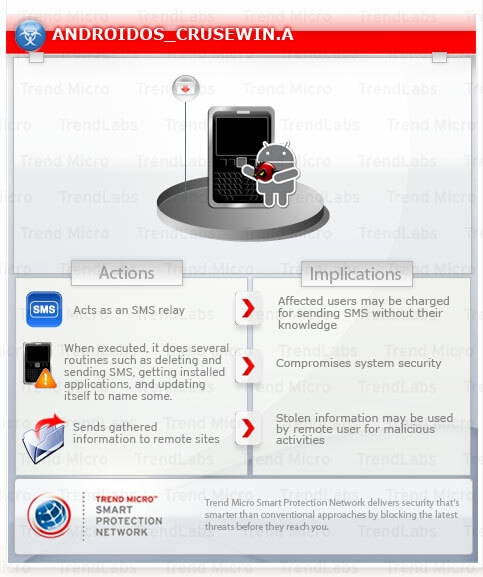 Download and install the Trend Micro Mobile Security App via the Android Market. Go to Settings > Applications > Manage Applications. Locate the app to be removed. Scroll and highlight the app to be removed, then choose Uninstall.